Beirut: Adnan Hassan, a Syrian Kurd, finally has hope for himself and his people. Two years ago, Daesh terrorists nearly wiped out his hometown, Kobani, along Syria’s border with Turkey and killed 10 members of his family. Now with the terrorists driven out and going down in defeat, a new university is opening in the town, and Hassan will be its professor for Kurdish language and literature. It is the first university in the self-administered Kurdish areas, and the first in Syria to teach Kurdish. The future of his people, Syria’s largest ethnic minority long ostracised by the government, could not look better, he said. Across the border, Iraq’s Kurds have sparked a major confrontation with their neighbours and Baghdad by holding a referendum for outright independence. Syria’s Kurds, meanwhile, are making major advances toward their own, less ambitious goal: winning recognition for the self-rule they seized during Syria’s war. They say their aspirations for a federal system in Syria may now find more international and domestic support, and they are positioned as a player Damascus must reckon with in any final resolution of the conflict. Perhaps more importantly, they have land. Backed by the US in the fight against Daesh, Kurdish forces control nearly 25 per cent of Syria. They hold most of the northern border with Turkey and have expanded into non-Kurdish, Arab-dominated areas. The Americans have set up bases there to provide battlefield support for the Kurdish-led Syrian Democratic Forces, as well as the training and advising of security forces and the new civilian administrations in liberated areas. The Kurds have also maintained close ties with Russia and are confident they can fend off Turkey, which is vehemently opposed to a Kurdish entity on its border. The ruling Kurdish Democratic Union Party, the PYD, heads a de facto self-rule administration in the Kurdish-majority region of northern Syria known as Rojava. As part of their efforts to promote a federal system, they elected new local councils late last month. By early 2018, they hope to elect their first regional parliament, representative of Kurds, Arabs, Assyrians and Turkmen. “In Rojava, we have a federal project. In (Iraqi) Kurdistan, it is the long awaited state. The two complement one another in realising the Kurds’ aspiration for a dignified life,” Hassan said. It is a remarkable turnaround. Syria’s Kurds were about 10 per cent of the pre-war population of 23 million, but Damascus had long suppressed any expression of their identity in the majority Arab nation. Jubilant Syrian Kurds celebrated their neighbours’ independence referendum by flying Iraqi Kurdish flags alongside the flags of their own militia from cars honking down the streets late into the night. But the surge in Kurdish power in both Iraq and Syria doesn’t mean the two sides are about to join: They remain divided by political rivalries. 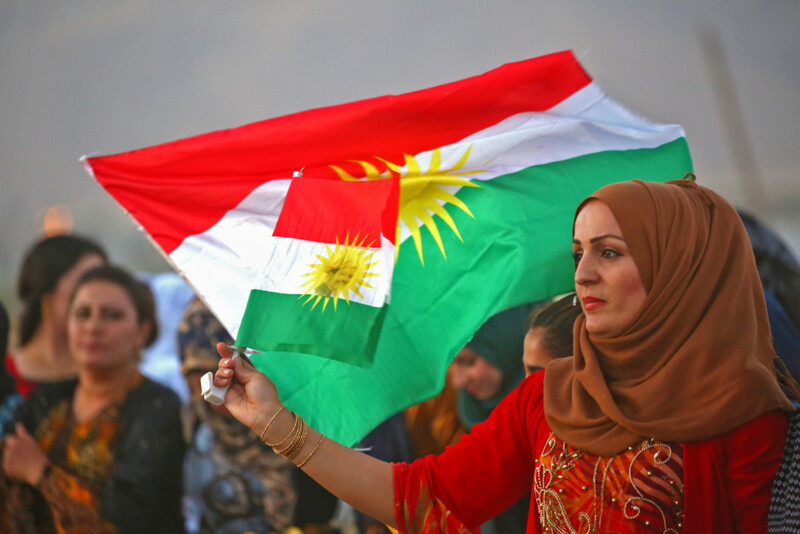 Iraqi Kurdistan’s referendum sparked furious opposition from Iraq’s government, as well as Iran and Turkey, who fear it will fuel secessionist movements among their own Kurdish minorities and dismantle the map of the Fertile Crescent in place since First World War. There was also a backlash from the Arabs. Syrian Kurdish leaders say their vision is for a federal system across Syria that would maintain unity while giving considerable autonomy to various regions. They depict their proposal as a way out of the country’s intractable 7-year-old civil war. In a first, President Bashar Al Assad’s government said it may be ready to talk to the Kurds. Syria’s Foreign Minister Ebrahim Al Muallem recently noted Syria’s Kurds want “some form of self-administration” within Syria unlike Iraqi Kurds’ push for independence. “This is something negotiable and can be discussed. When we are done with fighting Daesh, we can sit with our Kurdish sons and find a formula for the future,” he said. llham Ahmad, a senior Kurdish official in the political wing of the SDF, said the government statement can be a starting point toward negotiations, underlining that the federal proposal is not for the Kurds alone. The Syrian government is far from ready to share power, bolstered by battlefield victories and unwavering Russian and Iranian backing. Still its position is not secure, with local ceasefires on various fronts liable to crumble and a growing presence of regional and international forces on its territory. The Kurds represent an indisputable interlocutor amid a fragmented opposition, otherwise dominated by Islamists. But Syria’s Kurds could face a looming confrontation with Turkey. Ankara views the Syrian PYD as an extension of Turkey’s own Kurdish insurgency led by the Kurdistan Workers’ Party, or PKK, and is determined to avert Kurdish power next door. Last year, its troops captured a pocket of territory inside Syria to prevent a contiguous Kurdish hold along the frontier.